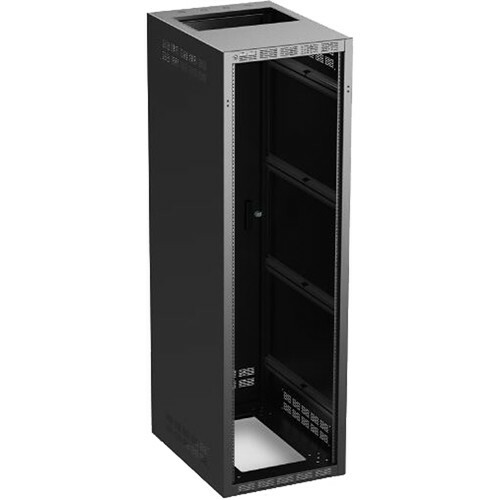 The Atlas Sound 240-18 is cabinet that fits 21 RU of rackmount gear in a vertical orientation. The cabinet is constructed out of 16-gauge cold-rolled steel and includes the base, side panels, top panel, 11-gauge mounting rails, and a removable rear door. The door can be oriented for right- or left-hand opening, and it sports a cylinder lock and a flush door pull handle. With an expanded 6-RU opening in the top and bottom, you maintain wire access or ventilation. You can also close these openings with vented or solid panels. This rack is 30.0" deep. A 3-RU blank panel is included. Rack rails are precision tapped at 10-32, and recessed 17.5mm. These plated rails include convenient RU indicator hash marks to aid in equipment alignment. Rails are standard E.I.A. 5/8"-5/8"-1/2" spacing. Conduit arrays are located on the top and bottom surface panels as well as the top and bottom back flanges. Flange arrays consist of five knockouts (three 1" standard, and two 0.5 x 0.75" concentric). Surface arrays are comprised of 4 knockouts (two, 1" standard knockouts and two 0.5 x 0.75" concentric).